Summary: Storms will happen, so do downturns in sales. Learn to play in puddles and add profit centers to your business cycle calendar! Not every day will be sunny, it’s going to be gloomy, rainy and then there are storms. “Storm” is lack of business or downturn in sales. This is the time you get to play in the puddles! I believe in the power of Profit Centers because they essentially diversify your risk in business. 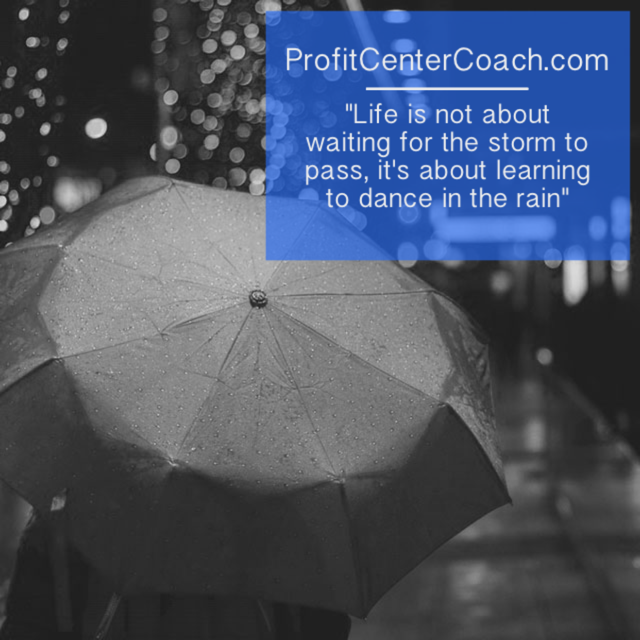 If you take the time to build other lines of profit to your business you will “weather the storm”. Continuing with our weather theme, you know that every year you are going to have seasons. Capitalize on this! Create a profit center for each season. It might not seem obvious, but every business follows a cycle triggered by a time of year. For example auto repair will have their profit centers of “maintenance” like an oil change or “body work” from a collision, but they also add events such as preparing for winter or summer road trips. Your business might have a holiday or a deadline centric product. Taxes have April 15, schools have graduation and back to class, retail has the holidays, and there are weddings in June. If your business has a focus on something like this, you have three months before to “plan”. It’s just a great way to build another a “planning” profit center to your business. This “planning” time is critical to your social media marketing success. This is exactly the area that you need to create your digital freemium of advice that you offer prospects in exchange for their email. When customers are searching for your product during the planning phase, your website will be there with information ready to help them. Once you get their email, you can continue to market to them and again help “weather the storm” of reduced sales. Tip: “marketing is the profit center” that we are all striving for as we build our database of interested customers! PS: if you love my post… give it a “like”! 2- Challenge yourself to turn this “planning phase” into a profit center. Including the capturing of information by creating a freemium! My goal is to get into a habit. And by habit I mean a good one. It’s funny but what do you think of when someone says they have a habit… since it’s commonly associated with a “bad” habit it’s hard to realize that habits are also good. My main habit right now is to get my audio podcast consistent along with my blog posting. My daily record keeping is not “quite there” but I’m working on improving! That’s why Day 5 and Day 6 are together! See…the audio blog is much simpler for me. And that’s where we’ll begin. What is the best format for content development for you? You need to focus on one major platform. This is your starting point. It needs to be easy and it needs to be effective. I like the audio blog or podcast because I don’t have to worry about what I look like! No seriously, I can record it and you can’t see me. Yeah, some people will say, “it doesn’t matter… just hit record” and I believe that, but I still feel more comfortable with the audio blog format. I’d love to go “live” and I will eventually, but the stress of having to maintain a consistent schedule of posting would drive me crazy (if I have to look amazing)! I can do a consistent, one minute inspiration, every day. So that’s where I’ll begin. What is your consistency? What type of content platform is best for you? On Day 5 (evening) here’s what I did… I actually wrote down, on paper, some goals. I know this seems like a no-brainer. You can search on line and it says… write down your goals. Well, by Day 5 evening, I felt a strong need to write the goals. It was imperative to my organization. Seriously, I found my “why” about the process of writing down goals. Normally I’ve been able to keep a good process in my head as to where I want to go and how to get there, but as you are noticing in my day by day journal to creating my online presence that it’s a lot of “chicken and the egg” and really, writing the goals down gives me a central location to track my progress. I’m going to challenge you to do the same. Make a goal sheet. How will you be measured, is it by number of posts, number of followers, number of dollars generated? Your choice, just make a goal sheet. Here’s where Day 5 and Day 6 get a little blurred. I bought a super cool program to help generate a freemium. The freemium is something you offer on your site in exchange for your visitors email address. Once you have an email address you have begun your list. As you know, maintaining “followers” on a social media platform is nice, but you have absolutely no control over your destiny. If someone like Facebook changes it’s rules, you can be shut down. However, if you capture and create your own list of contact information you have control. So I found this great program to make an ebook look amazing. I started using it on Day 6 and got frustrated. That’s when I decided I needed to stop. Instead of quitting I started working on the slide I would need. You know, I really like Slide Share – it’s fun! I’ll go back to the cool ebook program tomorrow! Where do you think you can create content on a regular basis? Writing, Video or Audio? Remember you need to start creating your own content, so this is an important decision! The follow up question is when will you start? Develop your goals for the week or month… and write them down!!! PS: Flip to my audio blog page and listen to my 1 minute inspirations… and if you enjoy my blog, please click follow! After going through my assessment of my websites I found several things to change now and a list of things that need to improve. The easiest thing was to start with my header. I decided “out with the old” and although I like the color teal, I just decided that the photo needed to change – also the website for my blog is not exactly the most mobile responsive technology out there. That’s an important point. You are ultimately responsible for your user experience. Sure, you may have a company that does your internet design, etc. But at the end of the day, you need to test your site. Make sure to test on a desktop/notebook, tablet, and mobile. Since we’ve long passed the 50% mark on mobile as the preferred internet use method, testing your site for mobile is essential. I had no idea mine was acting goofy… what was happening with mine is that the sides would narrow, but the photo would not. This left my image cropped to the middle, odd. The words also put a hyphen in the middle. It’s proper grammar, but it looked dumb. Now it creates a much better user experience on mobile. If you’re reading my blog on a desk top the photo is right in the middle and slightly smaller. Might seem small… it’s not a perfect solution, but it’s a good solution. Also on Day 4 I rebranded my old “brite goal” Instagram account to Profit Center Coach. Since I’m using it the same way as an inspirational site, the previous audience won’t be affected by the messaging. That’s important. If you are creating social media sites and then you change your focus, or pivot, make sure to consider your audience in the process. If your new message is very different from your old one, just start a new site. There’s no use is making angry followers because in the end that could hurt more than help. I also started working on my Freemium! This will be a neat ebook that is nearly ready to go. When it’s ready, I’ll let you know. You need to develop a freemium for your site, too. This is a product that you typically email to your customer upon request. The goal is to collect an engaged customer that is willing to trade you an email address for your free offer. Once you receive an email you are able to stay in contact with them. I say “typically email” sometimes it can be quite effective to mail the product. It depends on how much your end product is, the higher priced your retail product is the more likely a customer is to give you a mailing address early in the sales funnel. For our family marina I’ve used the mailing technique quite successfully. In fact that’s how I won my second “Best Profit Center Idea” title at the International Marina and Boat Yard Conference. Is your website mobile responsive? Test it on a desktop, tablet and mobile phone! What type of freemium can you develop? Brainstorm topics and write a 2 page give-a-way!